<h2>Sustainability is a &#039;top priority&#039; for chemists</h2><br /><p><strong>She&nbsp;has been developing&nbsp;applications for mixed-metal chemicals, which combine the highly reactive nature of metals such as sodium and lithium with the properties of less reactive metals such as zinc or aluminium.</strong></p> <p><strong>Can you tell us what green chemistry is?</strong></p> <p>'There are certain chemical processes that are conducted on an everyday basis that use toxic and volatile compounds that are bad for the environment. Green chemistry is about trying to find a more sustainable way of doing things that has a low impact on the environment. This can be getting reactions to take place under milder conditions so they don't require as much energy and using materials that are less harmful to the environment, or ideally, even biodegradable. '</p> <p><strong>Is chemistry in general going through a green revolution?</strong></p> <p>'Outside of the scientific community, there is often this slightly negative perception of chemistry - that there is nothing green about it. But that is not the case. Making processes as environmentally friendly and sustainable as possible has become one of the top priorities for today’s chemists. You can also see that in the scientific journals over the past decade, there has been a real move to focus more on green chemistry.</p> <p>'In our work, we didn't set out to find a green chemistry process, but it was one of the advantageous factors that arose from the reactions that we have been developing. '</p> <p> <div class="quote-view quotesBlock quote_horizontal"> <div class="quotesTop"><img src="https://horizon-magazine.eu/sites/all/themes/horizon/images/quotes_top.png" alt="" title="" /></div> <p>'Making processes as environmentally friendly and sustainable as possible has become one of the top priorities for today’s chemists. '</p> <blockquote><p>Prof. 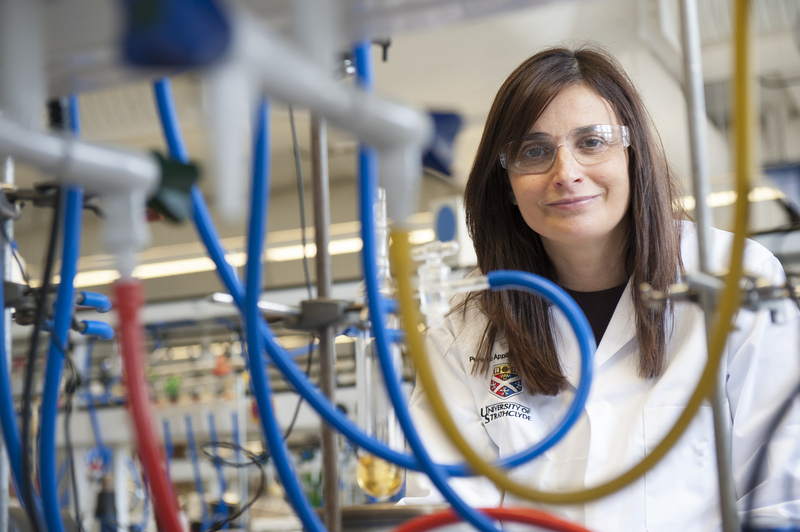 Eva Hevia, University of Strathclyde, UK</p></blockquote> <div class="quotesBottom"><img src="https://horizon-magazine.eu/sites/all/themes/horizon/images/quotes_bottom.png" alt="" title="" /></div> </div> </p> <p><strong>Can you give an example of a process that could be made greener?</strong></p> <p>'Many pharmaceuticals are made with large, complex, organic (carbon-containing) molecules. To create these synthetically, you have to use smaller molecules and assemble them in the right way to form these complicated scaffolds - it is a bit like putting together Lego bricks.</p> <p>'Many companies use lithium compounds to help functionalise the carbon-hydrogen bonds in the molecules they want to piece together. Carbon-hydrogen bonds are normally unreactive, so they need to be broken by the lithium so they will then form new reactive bonds that can be used to create the larger molecules.</p> <p>'The disadvantage is that these reactions need to be conducted at extremely low temperatures, which uses up energy. The solvents used in the reactions are also not very environmentally friendly.</p> <p>'As the lithium is so reactive, you can get a lot of other compounds being formed alongside the one you want. Separating these mixtures can be both time consuming and costly. '</p> <p><strong>You've been working on so-called mixed metal chemistry through the MIXMETAPPS project. How does this help to tackle this problem?</strong></p> <p>'We have been able to show that you can design bi-metallic compounds that combine lithium and zinc. Zinc is very selective about what it reacts with, but is poor at activating, or breaking, carbon-hydrogen bonds. Lithium, by comparison, is very reactive and so is good at this, but unfortunately is not very selective about the bonds it activates.</p> <p>'We have found you can bring zinc and lithium together to create a new type of compound, which has a totally new structure and reactivity profile. It can be as reactive as lithium but with the selectivity that comes from zinc. You get the best of both worlds. '</p> <p><strong>How can these new bi-metallic compounds make processes more environmentally friendly?</strong></p> <p>'As they combine the properties of both metals, you can perform reactions at room temperature and under mild conditions. This makes the reactions much more efficient and requires less energy. We have also found that certain reagents (reactive substances) have increased resistance to air and moisture.</p> <p>'By itself, lithium has to be stored under oil as it reacts vigorously when exposed to moisture. They also react with air. It means reactions that use lithium compounds have to be carried out in solvents that are not environmentally friendly. Using our new metallic reagents means we have been able to pioneer more environmentally friendly solvents that contain glycerol and water. Furthermore, we can work in the presence of air.</p> <p>'Using water in these reactions is the holy grail because it is non-toxic. '</p> <p><strong>Could these bi-metallic compounds be used to make pharmaceuticals?</strong></p> <p>'Yes, they could help to build these very large, aromatic molecules used by the pharmaceutical industry. Some of the complex molecules we have built recently are present in key drugs for treating Type 2 (lifestyle-related) diabetes.’</p> <p><strong>What else could bi-metallics be used for?</strong></p> <p>'Other groups around the world have already spotted the potential of main group bi-metallics as excellent catalysts for use in polymerisation reactions to create new plastic materials, for example. '</p> <p><strong>Why do you think this is an important step for green chemistry?</strong></p> <p>'Early in our careers as scientists, we are often told that these highly reactive metals are incompatible with water and air, but we have been able to challenge this and understand it better.</p> <p>'As scientists we need to be able to challenge the conventional wisdom. I think we can inspire other chemists working on their own problems to look for similar solutions.</p> <p>'We need a critical mass of scientists looking at these problems from different perspectives so we can tackle and meet the challenge. '</p> <p><em><strong>This interview has been edited for length and clarity.</strong></em></p> <p><em>The research in this article was funded by the European Research Council. If you liked this article, please consider sharing it on social media.</em></p> <br /> <img src=”http://www.google-analytics.com/collect?v=1&tid=UA-40077089-1&cid=sustainability-is-a-top-priority-for-chemists&t=event&ec=republish&ea=read&el=sustainability-is-a-top-priority-for-chemists&cs=republish&cm=republish&cn=republish&cm1=1" /> This post <a href="https://horizon-magazine.eu/article/sustainability-top-priority-chemists.html">Sustainability is a &#039;top priority&#039; for chemists</a> was originally published on <a href="https://horizon-magazine.eu/">Horizon: the EU Research &amp; Innovation magazine | European Commission</a>. She has been developing applications for mixed-metal chemicals, which combine the highly reactive nature of metals such as sodium and lithium with the properties of less reactive metals such as zinc or aluminium. Can you tell us what green chemistry is? Is chemistry in general going through a green revolution? 'Outside of the scientific community, there is often this slightly negative perception of chemistry - that there is nothing green about it. But that is not the case. Making processes as environmentally friendly and sustainable as possible has become one of the top priorities for today’s chemists. You can also see that in the scientific journals over the past decade, there has been a real move to focus more on green chemistry. Can you give an example of a process that could be made greener? 'Many pharmaceuticals are made with large, complex, organic (carbon-containing) molecules. To create these synthetically, you have to use smaller molecules and assemble them in the right way to form these complicated scaffolds - it is a bit like putting together Lego bricks. 'Many companies use lithium compounds to help functionalise the carbon-hydrogen bonds in the molecules they want to piece together. Carbon-hydrogen bonds are normally unreactive, so they need to be broken by the lithium so they will then form new reactive bonds that can be used to create the larger molecules. 'The disadvantage is that these reactions need to be conducted at extremely low temperatures, which uses up energy. The solvents used in the reactions are also not very environmentally friendly. You've been working on so-called mixed metal chemistry through the MIXMETAPPS project. How does this help to tackle this problem? 'We have been able to show that you can design bi-metallic compounds that combine lithium and zinc. Zinc is very selective about what it reacts with, but is poor at activating, or breaking, carbon-hydrogen bonds. Lithium, by comparison, is very reactive and so is good at this, but unfortunately is not very selective about the bonds it activates. How can these new bi-metallic compounds make processes more environmentally friendly? 'As they combine the properties of both metals, you can perform reactions at room temperature and under mild conditions. This makes the reactions much more efficient and requires less energy. We have also found that certain reagents (reactive substances) have increased resistance to air and moisture. 'By itself, lithium has to be stored under oil as it reacts vigorously when exposed to moisture. They also react with air. It means reactions that use lithium compounds have to be carried out in solvents that are not environmentally friendly. Using our new metallic reagents means we have been able to pioneer more environmentally friendly solvents that contain glycerol and water. Furthermore, we can work in the presence of air. Could these bi-metallic compounds be used to make pharmaceuticals? What else could bi-metallics be used for? Why do you think this is an important step for green chemistry? 'Early in our careers as scientists, we are often told that these highly reactive metals are incompatible with water and air, but we have been able to challenge this and understand it better. 'As scientists we need to be able to challenge the conventional wisdom. I think we can inspire other chemists working on their own problems to look for similar solutions.